Simon Hanson lives in rural South Australia. He works in a small school where his students teach him new things everyday. 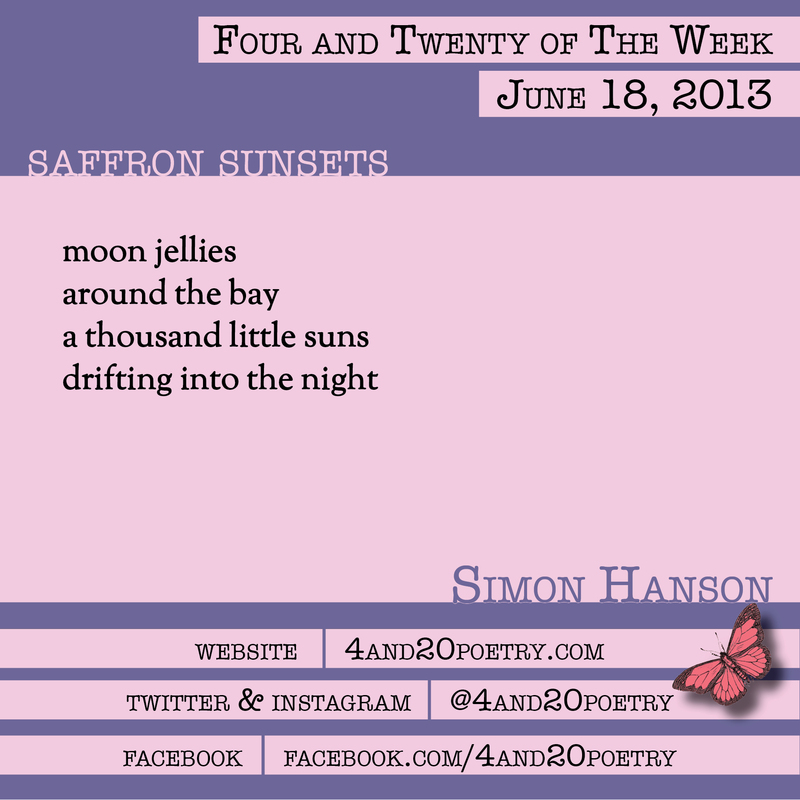 This entry was posted on Tuesday, June 18th, 2013 at 4:20 am and is filed under Four and Twenty of the Week, Micro Poetry, Poetry. You can follow any responses to this entry through the RSS 2.0 feed. Both comments and pings are currently closed. I have to admit, I don’t get this one. Is the word “jellies” an active word, like something moving, or is it a thing, like little globs of the moon around the bay? And what are the “thousand little suns”? Sparkles on the water, or something like that? If so, Don’t they just disappear when the sun goes down instead of “drifting” into the night? I guess I’m just not poetic enough for this one, my friend from down under. thanks for your thoughts – moon jellies are a type of jelly fish inhabiting Australian waters that sometimes congregate in their thousands (worth a quick image search on Google). They can present a wonderful sight as those floating on the surface capture the light of the setting sun in their translucent bells making them glow a lovely soft orange. They are the ‘thousand little suns drifting into the night’.